I must say I was appalled when I read this piece this morning (and responded with several tweets of my own). I called this decision “naive and unfortunate”, and finally decided to jot some of my points down here. As apprehensive as folks may be, smartphones have changed the way we work, create, live, interact with others….indefinitely. Yet, when considering all the other forms of technology humans have developed, feared, and embraced (or succumbed to), we must keep perspective and view them as a now ubiquitous way of being (for a lot of the world, anyway). I believe, as do many others, that they are a mere stepping stone to becoming full-blown cyborgs…that sooner than we think it might be perfectly normal to have some degree of biotech embedded in us. Instead of sticking our head in the sand, avoidance, or demonizing the device, we as educators and parents have a chance to help students master the tool rather than become its slave. We can teach balance and etiquette…we can have open conversations with young people about empathy, civil behaviour, managing time and attention (for more on “infotention” refer to the work of Howard Rheingold). Why run away when we can confront this strange new world head on, and, in doing so, make enlightened rules for navigating this environment? This view comes from one of my intellectual heroes, Marshall McLuhan. He argues that “any medium whatever is an extension, a projection in space or in time, of our various senses”, but unlike the wheel extending the foot, for example, electronic media is an extension of the entire nervous system. Freud was on to something, too, when he mused: “With every tool (man) is perfecting his own organs, whether motor or sensory, or is removing the limits to their functioning”. The funny thing about smartphones is that they are handy (in fact, they are called “handy” in Germany!). Unlike the TV, radio, computer, or automobile (all forms of media/ tech McLuhan explores), they are with us, carried on our person. I’ve been known to refer to my phone as my vade mecum…my “go with me” in Latin. We have in effect become cyborgs already (something Amber Case discusses in her TED talk). If we accept this notion, then to criminalize this device – to force students to exile them into a communal box at the start of class – has a cognitively crippling and emotionally demoralizing effect. Again, we have the choice between apathy and artistry. We can and should have important conversations…transparent thinkathons about the impact of this particular extension of self. But, simply attempting to amputate something that is now a part of so many of us is frankly disrespectful. It’s no secret that much of what students are learning is outside of the traditional classroom, from media that has broken away from print (such as YouTube or hands-on extra-curricular experiences). Access to certain platforms – particularly social media – if leveraged with intention and purpose, can greatly enhance a learning experience. With my high school students I experimented with “Twitter questions of the week” that anyone could join, combinatorial creativity projects with schools from across the nation, blog portfolios that were published for a global community, backchannel socratic seminars that welcomed voices outside our organizational bubble, and sharing of student creative work to a larger, more relevant audience. Why deny this opportunity to connect with others and publish work in an authentic way? Moreover, negotiating in these varied spaces necessitates understanding the medium / platform, intended audience, and how to respond to feedback or engagement appropriately. As education becomes more about formative assessment, developing portfolios of work, archiving student projects and “visible thinking” (metacognition, etc. ), the smartphone camera app becomes THE essential tool. Whether it’s still or video footage, student or teacher-generated, the camera-that-is-always-with-you is incredibly valuable in its ability to capture the “mind and making moments”. I often suggest in my workshops to offer students the chance to be “paparazzi” for the class…they can run around interviewing peers and snapping shots of work in progress. Perhaps the most important point is that these devices allow everyone to be creators of high production-value artifacts (if only we would embrace them!). Yes, they can be overwhelmingly used for consumption, and there is a danger in that. If students are privileged enough to possess smartphones (and even if only a few students in the class do, they can form creative teams), they should be allowed – no, encouraged – to express themselves creatively with the myriad of tools available. Personally, I have made a little challenge for myself for the past year or so. I wanted to see if I could do all my creative work on my iPhone 6. I make things daily for pleasure and often for work. I’ve used the apps I have to develop custom graphics, slide decks with original art, stop motion animations and musical gifs, promotional materials for my book, blog posts, photo essays, films, vlogs, even my own typography! At the moment I am creating a photo book comprised of digital collages I made whilst experimenting with Dadaist techniques. I’ve even developed a “Mobile Sapiens Safari” with artistic prompts folks can take part in during a conference. I wish the French government would put its energy into training teachers to effectively integrate and maximize these technologies in their curriculum rather than outlawing devices. 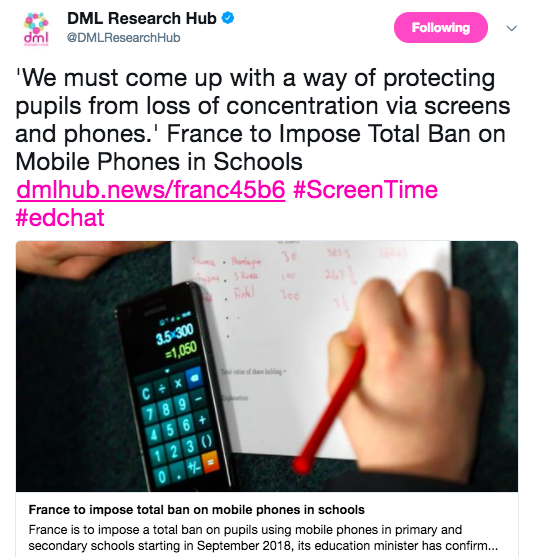 Of course this goes beyond France, as many classrooms feature a “drop your phone here” box at the door, and I know of several schools who ban any use of cell phones on campus. Are there problems we need to address? Of course. 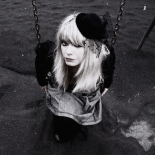 Are there misuses and abuses? You bet. But, just like the abstinence movement or the “Just Say No” to drugs campaign, I fear that such a black and white (and hostile) approach will ultimately backfire. More importantly, rebel culture will prevail. If unguided…lacking direction to channel this attraction to technology into more creative and ethical pathways…I fear students will become subservient to a drug-like device (and the kooky algorithms that seem to dictate much of our behaviour online). I like to compare smartphones as they are this moment in time to language. McLuhan discussed language as a technology quite a bit, and as an extension of the self I think the smartphone also externalizes our brains in a similar way. But, due to the networks afforded by connectivity and the apps that allow for creative expression and distribution, perhaps even more so. This entry was posted on December 12, 2017 by amyburvall in rawthoughts and tagged amy burvall, cell phone, creativity, dml hub, edtech, france, Freud, McLuhan, phone ban, smartphone, technology.